Shri Ramites celebrated Van Mahotsav, the annual tree planting festival, on 18th July. This year, the students from PV to Class V planted fruit trees near the extended swings area. These included mango, peach, pomegranate, papaya and guava. Fruit trees are magnets for birds and we hope to see many more visiting our campus now. The children of Class I marked the day with a special assembly on Van Mahotsav emphasizing the importance of trees. They shared interesting facts about trees and ended the assembly with a beautiful song on taking care of the environment. The corridors were decorated with boards on Van Mahotsav. Trees made from newspapers by the children, decorated with leaf printing on recycled paper looked wonderful. There was a surprise awaiting the children in the Home Room period. 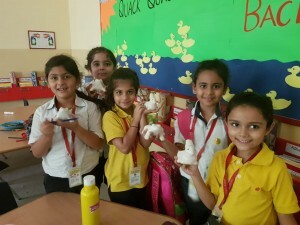 Each child got a Jade sapling to take home in an animal shaped planter. Dispersal time saw a lot of happy faces excitedly carrying their saplings home.